Matt highlights a problem with one of our most precious resources – soil. In some places in the UK, experts believe the soil is so bad it has less than 60 harvests left. Matt meets farmer Tim Ashton who believes the answer is to stop ploughing the land. Tim adopted a no-till approach five years ago believing it increases organic matter in the soil and reduces the need for fertilisers as well as providing better water drainage and more worms in his soil. Ellie visits the Small Woods centre in Ironbridge where they teach management techniques to help conserve our fragmented woodlands. She learns how to layer a coppice with volunteer co-ordinator Rob Marshal, turns a chair leg on a pole lathe with professional woodsman Mike Taylor and helps with the restoration of England’s longest railway gates with master woodworker Neill Mapes. Tom investigates how farmers have been left out of pocket by the government's current environmental subsidy scheme.He discovers some landowners are now thinking twice before turning over productive land to benefit wildlife and the environment.And he hears how some businesses have been brought to their knees waiting for tens of thousands of pounds in payments thanks to a major IT blunder.So could the government's vision of an even more green-friendly farming future falter before it's even got off the ground? 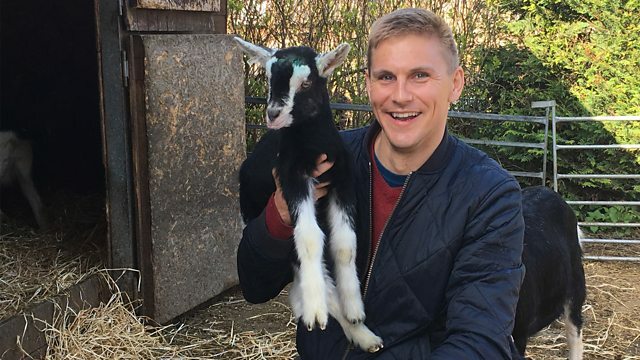 Steve meets 24-year-old Jade Rhodes, whose love affair with goats started at young age as her grandparents farmed them and showed them. Today, she keeps goats in her back garden and makes soap from their milk. Steve has a go at bottle-feeding the kids, milking by hand and making the soap. Adam travels across three counties to meet various food producers working together to make something naughty but nice - crisps! He starts in Herefordshire to find out why the local terroir is perfect for growing spuds and also gets a tour of the on-site crisp factory. Adam then heads to see Charles Martell in Gloucestershire who makes a hop-covered cheese which is powdered to make a flavouring. Adam then crosses the border into Worcestershire to find out about a natural resource that's been locked underground for thousands of years - brine. Ellie meets John and Karen Roberts, Shropshire farmers with a passion for their local Clun Forest sheep. Arriving just in time to meet the spring lambs, she discovers the ancient history of this hardy hill breed and how the Cluns have improved the fortunes of the Roberts family. Long barrows date back to prehistoric times. They were burial places, where ashes or remains were interred. However, Matt visits Soulton Long Barrow, which has only recently been built. Matt also meets stained glass artist Annette Jackson who makes glass panels, inspired by nature, to cover the individual niches inside the long barrow. And he helps her make a panel of a badger to go into the barrow.